‘Rebuilding Lives’ is an early intervention model and is targeted at people who are vulnerably housed and at risk or potential risk of homelessness. Our initial goal is to prevent this from happening. Providing people and families in crisis with weekly supplies of food in a safe and supportive environment is how we connect with people at risk who would benefit from our unique support programme. Our immediate concern is to ensure that people forced to make the horrific choices between eating and keeping warm or paying rent, do not go hungry, a situation which has a devastating effect on someone’s mental and physical health. This is where, and how, our intervention begins. Beyond the initial stabilising of the crisis, people have complex and multiple needs which can only be effectively met by building meaningful relationships, over time, coupled to a joined-up multi-agency collaborative approach. It is the need for food which brings people to us in the first place and if we do not have enough food on our shelves, then nothing else can happen which makes keeping our food supplies in pace with the demand for our services a critical challenge of our work. Given the high volumes of food involved and the hygiene and environmental safety regulations, it is simply impossible to operate professionally and properly without a 'fit-for-purpose' well-equipped food distribution hub with robust food handling logistic systems and procedures. The Matthew Tree Project Food Distribution Centre is a large commercial warehouse property located at Lawrence Hill Industrial Estate, near the M32, and is equipped with commercial grade walk-in fridge and walk-in freezer. We operate a fleet of commercial vehicles with temperature control capability. The distribution centre and all food logistic operations is run by a small and skilled staff team supported by a large army of trained and well supervised volunteers. By 2018 The Matthew Tree Project distributes the food equivalent of circa. 2000 nutritious meals each week to people and families in need and who are unable to afford food. All food is donated, 71% comes directly from the food industry, which would otherwise be thrown away and 29% comes from the general public via food appeal drives and personal donations. 61% of the food given out is fresh produce (fruit and veg), chilled or frozen foods (diary, meat, fish); 39% is ambient (packets /tins /jars /long life). By the end of 2017 the annual value of food donated to The Matthew Tree Project and redistributed was circa. £200,000. The Matthew Tree Project is growing its own food (using organic principles), for distribution to our client group. Our first urban food growing garden is equipped with a professional polytunnel and is located in Brislington, Bristol. Our first harvest was gorgeous spinach which went directly to our clients in June 2018. The urban food growing project is primary ran by volunteers and encourages clients to get involved and learn new skills and the opportunity of a share in the harvest. From 2019, The Matthew Tree Project is in the process of setting up its own commercial grade food production kitchen to provide skills training opportunities and possibilities for new careers within the catering sector in Bristol. Utilising food grown locally as the main ingredients of the uniquely developed recipes the kitchen will produce a range of food products for consumption in our own Deli Cafe & Food Shoppé. The graphic below depicts the daily food logistic activities of The Matthew Tree Project throughout the city of Bristol from 2018 onwards. 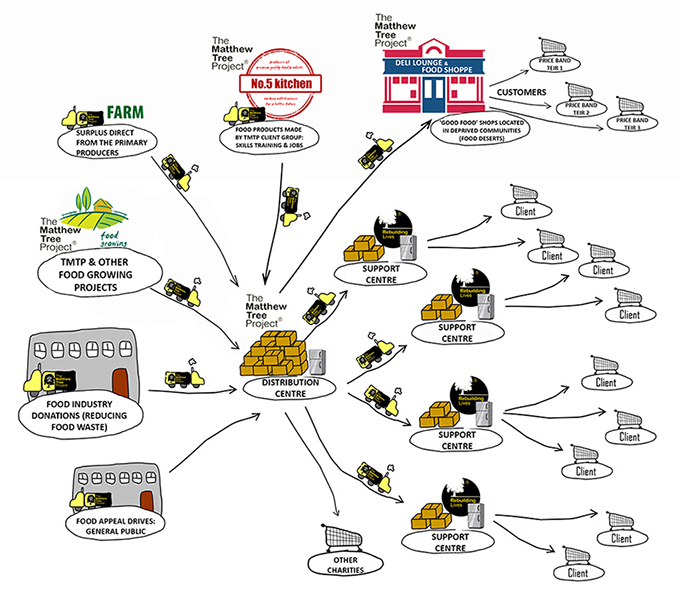 The Matthew Tree Project city-wide food logistics and distribution operations are shown in the diagram below.